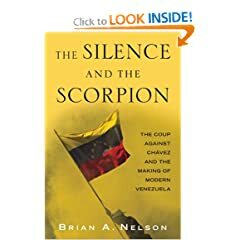 Mr. Nelson is a former Fulbright Grantee to Venezuela and the author of the new book about the 2002 coup against Hugo Chávez, The Silence and the Scorpion. He teaches for Johns Hopkins University’s Center for Talented Youth. Many are calling Venezuelan President Hugo Chávez “Castro’s Heir”—a man destined to be the perpetual thorn in the side of the United States just as Castro has been for the last 50 years. Like Castro, Hugo Chávez wants to expel U.S. interests from Latin America while simultaneously expanding his own brand of socialism. But unlike Castro, Hugo Chávez has the massive profits from Venezuela’s oil industry to actually make a difference. In 2007 alone Chávez gave $8.8 billion in aid to his Latin American neighbors (the U.S. gave only $1.6 billion, most of it earmarked for Colombia). What’s more, Chávez has set up four TV stations to broadcast his ideological message and has even given aid to the Colombian FARC. While Cuba’s renewed popularity has been partially fueled by the failure of U.S. development programs in the region, it actually has much more to do with Castro himself than many people realize. In fact, the long battles that the Cuban leader fought—and appeared to have lost—during the Cold War are now paying big dividends. Venezuela, in particular, was a very important Cold War battleground throughout the 1960s. Castro saw Venezuela not only as an inexhaustible breadbasket of natural resources—it is the world’s sixth largest oil exporter—but also a beachhead into the rest of South America from which he could expand his socialist revolution. However, by the end of the 60s, Castro’s patriot games were causing the Kremlin considerable embarrassment as it tried to negotiate détente with the U.S. Finally, First Secretary Brezhnev threatened to pull Soviet subsidies to Cuba if Castro didn’t behave. Castro reluctantly complied. Without Castro’s support, the FALN quickly collapsed. In an effort to move the country forward, the Venezuelan government offered the guerrillas amnesty if they would renounce violence. Almost all of the FALN leaders complied, with one important exception. A man named Douglas Bravo refused to take the nonviolent route and continued his attacks on the government. By the mid 1970s, Hugo Chávez was a lieutenant in the Venezuelan Army working in counter-insurgency: it was his job to hunt down and eradicate the remaining guerrillas—principally Douglas Bravo. But Chávez quickly found that he empathized with the guerrillas, whom he considered peasants fighting for a better way of life. Chávez was about to leave the army in disgust when he discovered that his brother, Adán, was secretly working with Bravo. Adán arranged for the two men to meet. “He inspired me and I realized I wouldn’t be leaving the army,” Chávez later said. Indeed, the two worked closely together for nearly a decade. At Bravo’s urgings Chávez began spreading their revolutionary ideology within the military with the goal of eventually taking power in a coup. Hence, Chávez spent most of his military career developing his own idea for socialism based on the Cuban model, all the while trying to maneuver himself into a position where he had more troops and more hardware. The opportunity to launch a coup finally came on February 4, 1992. But unfortunately for Chávez, President Carlos Pérez had been tipped off to the conspiracy and was ready. After a brief firefight outside the palace, Chávez was forced to surrender. Then a curious thing happened. Chávez suddenly became a national hero. Why? At the time Venezuela was reeling from more than a decade of recession which most people blamed on the corrupt two-party political system that had been in place since 1958. In Hugo Chávez people saw someone taking a stand against corruption; someone brave enough to risk his life to change Venezuela. And even though Chávez was put in jail, he was so popular that he was quickly pardoned. Enter now another communist veteran of the guerrilla movement of the 1960s and good friend of Douglas Bravo’s—Luis Miquilena. Like many of the former guerrillas, Miquilena had not given up on his dreams of making Venezuela a socialist state and he felt that if he could launch the popular Hugo Chávez as a political candidate he might very well succeed. Chávez—who still believed that true revolution could only be achieved through armed struggle—reluctantly agreed. Miquilena then took Chávez to visit Castro. The Cuban leader was not only waiting for them on the tarmac, but accompanied them the entire trip, even staying up past midnight and cooking with them. Castro, too, realized the potential of the charismatic Chávez. In 1998, guided by Miquilena’s political expertise, Hugo Chávez was elected president of Venezuela. The socialist revolutionaries were back. Very quickly, the Chávez-Castro connection became very strong. Between 1999 and 2004 the two leaders met more than 15 times and reportedly spoke on the phone every few days. In addition to their shared socialist vision, both leaders have gained enormously from the partnership. The year that Chávez came to power, 1999, was the year that Russian subsidies to Cuba negotiated during the Cold War finally expired—leaving the island desperate for foreign aid. Venezuela neatly replaced Russia as Cuba’s economic lifeline. Today, Venezuela’s oil shipments to the island amount to $2.5 billion per year, which allows Castro to bolster the Cuban economy and keep the revolution alive. For Chávez, a young and relatively inexperienced statesman up against a powerful opposition, the expertise offered by Castro in running a social revolution is invaluable. But even more important for Castro is that a Cuban-Venezuelan alliance means that the revolution can once again expand—which it certainly has. Through Chávez, Castro—now in his twilight—has at last made his beachhead into South America. The inroads that he had tried to accomplish through armed revolt since the 1960s—in Bolivia, Colombia, Nicaragua, and Venezuela—have finally come to him through the Venezuelan ballot box, then, subsequently, through the Bolivian ballot box, the Nicaraguan ballot box, and, most recently, the El Salvadorian ballot box. Where this pro-Castro tide will end is, for the moment, anyone’s guess. ..."the expertise offered by Castro in running a social revolution." That phrase is not accurate, nor did it spring from anyone with a right-wing Weltanschauung. The accurate thing to say is what any right-winger would say, and also what anyone without a prejudice would say: Castro shared with Chavez his expertise in running a brutal dictatorship. The US has been loosing political, economic, and ideological dominance in Central and Latin America in the course of the last two-three decades, with fastest rate ever. such a sad (for the world's sole superpower) development? Can it be still drastic state of the economies of those Latin countries that have been receiving huge amounts of money from the US, for being trusted allies in "war on drugs and terror"? Can it be the US wholesale sponsorship and support of the most reactionary and brutal regimes on the continent? Can be centures of the US bloody military "interventions", called "agressions" in international thesaurus, and legitimized through direct and by-proxy massive violence and bribery exploitation of the continent's natural resources? main driving element of the latter is the covert and open provocations and operations (surely, anti-democratic, despite being supported by the great majority of the populus) of Castro's and Chavez' agents. All complexity of the discussed issue(s) is trivialized in the terminology and ideological approach of the Cold War era, that to the best of our knowledge has ended almost exactly when the US clout on the Latin American continent has started to fade with greater acceleration. What do you write Prof., history or right-wing ideology?